The number of foreclosures on all types of residences, including holiday homes, offices and farms, reached 119,442 last year, almost 10 percent higher than in 2013, according to data from the National Statistics Institute. Foreclosure procedures on main residences rose to 34,680 families in 2014, an increase of 7.4 percent over the previous year. Andalusia, Catalonia and Valencia were the worst-affected regions. 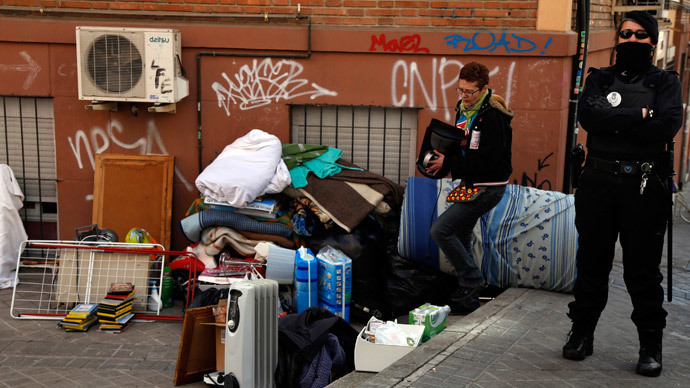 Evictions have become a symbol of the economic crisis Spain has been struggling with since 2008. Most of them were connected to mortgages taken out during property booms in 2006 and 2007. The situation has provoked nationwide protest. Campaigners often rally outside homes in an attempt to prevent residents from having to spend the night in the street. They are calling on the country’s authorities to make more housing available, or allow vacant housing following developers’ bankruptcies to be used. Spain has seen a six-year recession, with unemployment reaching 23.7 percent by January 2015, a decline from the 25.93 registered in January 2014. Still this year’s result is second only to Greece in the eurozone, where the jobless rate stands at 25.7 percent. Separate estimates show it might take the country over a decade to bring unemployment back to the pre-crisis level. Evictions are the main topic for Spain’s political parties in their electoral campaigns. The country’s government introduced several temporary changes to help the most vulnerable households avoid evictions. In Spain residents are liable for mortgages, even after their homes are returned to banks. In December, Spanish Prime Minister Mariano Rajoy said that 2014 was “an economic renaissance” for the country, as figures were expected to show GDP grew 1.4 percent. “2012 was a year of budget cuts for our country, 2013 a year of reforms, 2014 of an economic renaissance, and 2015 will be a year of an economic takeoff,” TASS quotes Rajoy talking to his conservative Popular Party.